"It'll be up to Jorge, Vale and hopefully our two guys to give Marc a hard time" - Herve Poncharal, Tech 3 MotoGP. 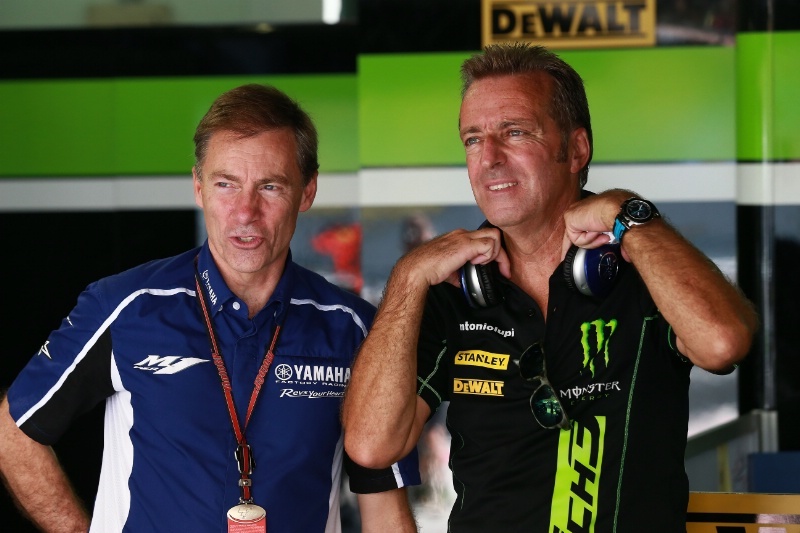 The first part of an exclusive interview with Herve Poncharal, boss of the Tech 3 MotoGP and Moto2 teams, as well as president of teams' association IRTA. 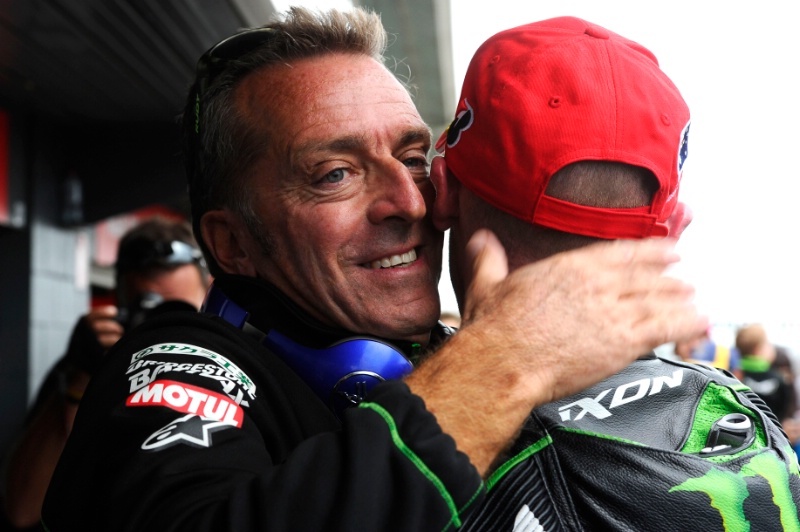 How are things at the Tech 3 headquarters Herve? I would say it is one of the busiest times of the year because you have to work on the trucks, the pit complex, the canopy, the team clothing, the contracts. We are also working very hard to have the freight ready to ship to Sepang, which will leave our workshop on the 20th and we have to coordinate everything with Japan. Regarding Moto2 we have to build the bikes, which includes waiting for parts from suppliers. So it's a very busy time. Has it been unusually busy, or as busy as ever? We are as busy as every winter. We are not far from 30 seasons as a race team now, so we know what we have to do. But there are always some things you cannot plan for and have to react to. Honestly, all the guys here are looking forward to the start of MotoGP and Moto2 testing. Because although it's a busy time, it's also a bit of a 'boring' time, not getting to see the work you are doing paying off at the race track. 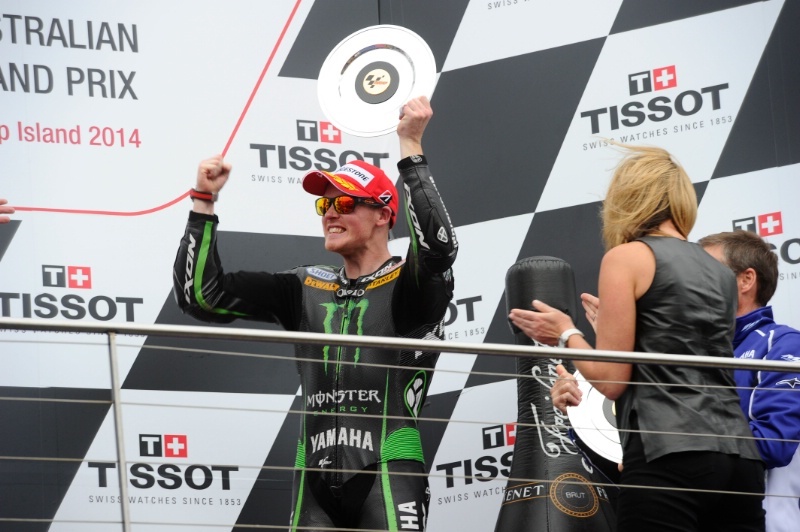 Tech 3's Bradley Smith took his first MotoGP podium in 2014. 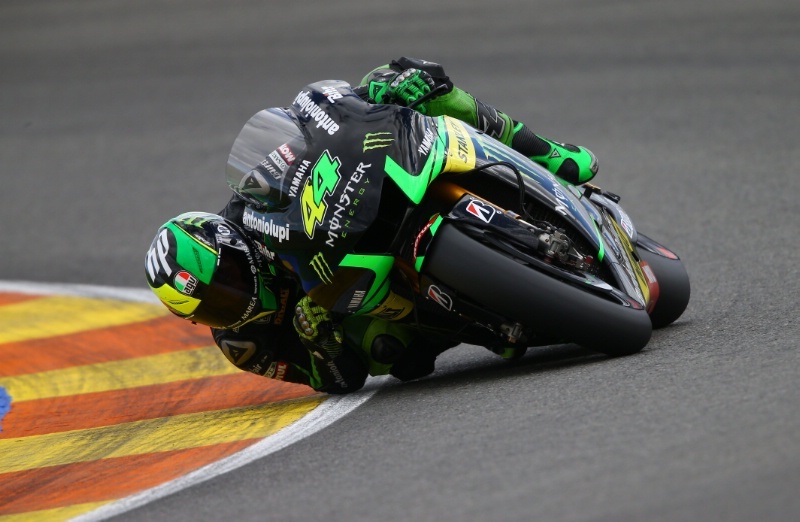 Rookie team-mate Pol Espargaro finished as the top satellite rider. 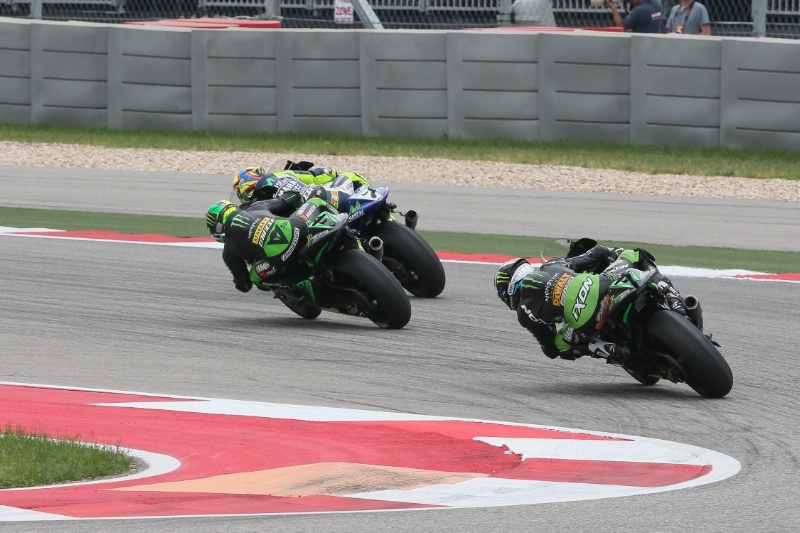 What is the atmosphere at Tech 3 like after last season - did you reach your targets? For sure if you compare 2014 with 2013, just the results without knowing anything else, we didn't do as good. Cal [Crutchlow] got four podiums and seven front rows for us in 2013. In 2014 we had two front rows - Brad in Qatar and Pol in France - and one podium, with Brad in Australia. So the results were not as good. But you know as well as me that there was a major regulation change. We now have the Open class with different fuel capacity and different tyre choice. Behind the top four Factory guys, the other riders are quite close to each other and clearly the Open class advantages - especially the softer tyre - made a difference in qualifying. And qualifying is more and more important for the race, where the first five or six laps are crucial. Although Bradley was not a rookie anymore, we had two young riders with a lot to learn. So it was more-or-less on plan and what we were expecting. I'm not going to say we are very happy, finishing where we finished, and it was a tough year at times. Both of our guys have been fighting hard. Sometimes too hard and both of them crashed quite a few times. That showed they were pushing too close to the limit, but I think they have learned a lot. We decided to keep them both. Pol was on a two-year deal anyway and we decided to give one more year to Brad because we believe he has not shown his best form yet. So we are satisfied with 2014 - otherwise we would not have kept the same riders - and very excited to see what is going to happen in 2015. Lin Jarvis (Yamaha Racing managing director) also feels giving Ducati the Open class concessions made things tough for the satellite teams. 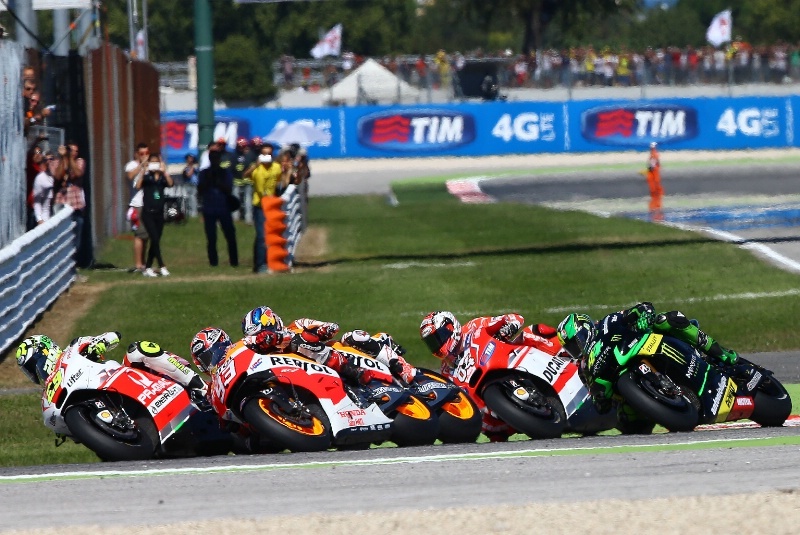 How much of a concern is that for 2015 when the new Ducati should be even stronger? It's a concern for sure. But we also know that the Factory Yamaha team have almost the same spec bike as us and Rossi and Lorenzo managed to be at the front with Marquez and Pedrosa. So we can say what we want about the technical rules, but we are not using our package at 100% like the Factory Yamaha guys. We also know that it is only one more year with all these different rules, because from 2016 everybody will have the same fuel capacity, same tyre choice and same electronics. Everything will come back to normal, let's say. We took this decision for different classes in 2014 and 2015 because the manufacturers didn't agree to use the same electronics before 2016. It was also to give new factories, or the factories that were struggling a bit, the possibility to be closer to the front. I think everybody was quite happy to see Ducati almost reborn in 2014. To see a smile on Dovi's face again and occasionally for Cal, Andrea and Yonny. This was good. It is also good to help Suzuki and Aprilia for their comeback season. A bit of extra support. Last year there was only one strong Open bike. In 2015 for sure the Yamaha Open bike will again be very close to our bike and 'dangerous' in terms of competition. But now Honda has also changed their view of the Open class and have done what Yamaha did. So there will be a lot of competitive bikes: The Open Hondas and Yamahas will be very strong, Ducati is going to be stronger, plus the eight full Factory bikes - not including Aprilia who might need more time. For us it is going to be difficult, but as we say in France 'there is no fun if there is no fight'. Hopefully there will be plenty of fight and fun this year! I'm sure for the fans and the media it's going to be exciting because we should be closer to a Moto2 or Moto3 type situation in terms of competition. You mention 2016, how do you see the single set of technical rules playing out for the satellite teams? For me this is what we have been looking for, what we have been pushing for. When I say 'we' I mean the teams, Dorna and the FIM. It was a bit difficult for the manufacturers to understand that they will have to give up R&D on the electronics, which was their speciality. It took a while for the manufacturers to understand that we have to be on the same tyres and the same electronics. Just because we cannot afford to continue like we are doing and have this incredible inflation - which even some factories cannot afford. I am very happy to finally have this situation because it will also give the possibility for satellite teams to be closer than ever to the factory teams. From 2016 almost everyone on the grid will, on paper, have a winning technical package, as is the case now in Moto2 and Moto3. There will finally be the possibility to come back to the old days when satellite teams could win MotoGP races - and why not championships? But we must never forget that in our sport the biggest factor is the rider. Full stop. The difference between the factory or satellite package is already very close. Certainly for Yamaha and I think other manufacturers. For example a lot of times in 2013 Cal, who has always been an honest guy, said 'if you gave my bike to Lorenzo his results will not change'. I understand why the media, fans and sometimes riders talk about suspension, electronics or technical crew as the problem. It's because they don't like the brutal fact that someone else is faster. So if from 2016 the satellite package - bike, tyres and electronics - is almost identical to the factory guys, the racing will not only be closer but my dream is that sponsors will devote enough financial resources to convince a top rider to come with us, or any other satellite team. There are lots of examples in the past where top riders on satellite bikes beat the factory teams. One of the big changes for 2016 is Michelin taking over the single tyre supply, as a French team you must be pleased to see them back in the sport? Michelin has always been a big name in motorsport, two wheels and four wheels. Of course they are French but that doesn't mean too much. Okay, we are happy to see a big French company invest in our sport because it will help the sport be followed more in France, which is not the case at the moment. The main thing is that Michelin were very keen to come back to MotoGP and they have the know-how to give us a top-level product, which will make the grid competitive. With a single tyre rule it is important to have a manufacturer that can match the level of the machines and the riding. This year we haven't talked so much about the tyres, maybe only in terms of the soft tyres allowed for the Open class, but outside of that everyone has the same tyres and it's up to you to make the best of it. Already from the first Michelin tests with the factories the feedback has been very good and the lap time really promising. I'm sure it is going to be interesting. Clearly we will have some tests prior to 2016, starting at Sepang II when the full grid will run on the new Michelins for the first time. Each tyre manufacturer has a different way to build their tyres, the construction and the compounds. You have to adapt your bike and riding style around the specific nature of the tyres. It will be interesting to see how everybody copes. The Sepang tests will see your riders using their 2015 race bikes. In terms of specification, will you get the bikes that Rossi and Lorenzo finished last season with? It's always difficult to be precise because even between Vale and Jorge, or Dani and Marc at Honda, they don't use exactly the same package. Sometimes they use two different chassis because one works better with the style of rider A and not rider B. Same thing for electronics, suspension parts. We have great support from Yamaha, as the results we've had in the past have shown. In the Valencia post-race test we got our 2015 material, which was basically what Vale and Jorge used during the last grand prix. So it was the final evolution of the 2014 season for the factory team. This is what we will run again in Sepang I. But after that it all depends on what is happening in terms of development, or what can be changed given things like the engine freeze. It also depends on what the factory team want. You know sometimes the factory team asks for Tech 3 parts, even if they are six months or one year old. When a rider is struggling a bit sometimes he wants to confirm something. As Masao Furusawa [former Yamaha MotoGP boss] always said, 'Yamaha have four factory bikes. Not two factory and two satellite'. Clearly the most advanced spec and the latest developments are the priority for Vale and Jorge. But there is a big stock of spare parts and different things that Yamaha carries from track to track that are distributed according to what the riders request and their riding style. So it is not easy to say this is exactly what we have, because from one race to another and almost from one practice to another, our package is changing. What I can tell you without appearing like I'm polishing the shoes of my technical partner is that we have a very competitive package and both of our riders can go quicker. They have got to learn and understand how. Is our bike exactly the same as the factory team? No. Is it close enough to fight with them? Yes. Will you have a full seamless gearbox this year? [Last year's Tech 3 bikes were seamless from 2nd gear onwards during upshifts. Rossi and Lorenzo had the full range of seamless upshifts and are hoping to also get seamless downshifts in 2015]. I don't want to go into too many details. We have a great gearbox. I don't think we have lost anything because of the gearbox we have. Of course the factory is working non-stop on developing every aspect of the bike including the gearbox. We will see what we have to test. Before coming to Sepang I in 2014 there was a big, big request from both Brad and Pol to get a seamless gearbox. In Sepang II we received it, it was a massive improvement and they were really happy. Now we have that gearbox which has worked really, really well. There were no complaints. We know that it can be eventually improved, but now we have to work with the factory and see what we've got. What we have is good enough to be fighting at the front for sure. Looking at the very front, do you think Yamaha - Rossi and Lorenzo - can match Marquez and Honda next year, or is Marquez just going to get even better in his third year? For sure Marc was incredibly strong last year and the year before. Some people said he was more impressive in 2013 than 2014. Hmmm. I doubt it because winning the first 10 races out of 10 is quite an achievement. I read your interview on Crash.net with Daryl Beattie and I agree with what he said. Mick [Doohan] was incredibly dominant for many years and the man to beat. Then Valentino arrived and he was the man. He is still doing it but at that time he was incredibly strong, with the Honda and Yamaha. Then Casey arrived and he was the reference. He decided to stop early and now we have Marc. Marc is the new reference. He is the new Mick, the new Vale. I don't want to take anything away from Vale, Jorge and Dani but clearly what Marc has done in 2013 and 2014 impressed me more than a lot. Also we can't forget that Marc is the youngest of the top four, with the least experience of MotoGP. So it means he is also the one on paper who still has the biggest improvement margin. I really hope Jorge and Vale can give him a hard time this year. It is going to be very important to show your strength in the opening round in Qatar, more than in testing in Malaysia when the lap time depends on the time of day and the temperature. Last year the incredible fight between Vale and Marc in Qatar proved to be a sign of how the championship would turn out. The fact that Marc won it was very important for him. He was able to show his authority right from the start, Vale proved he could fight, while Jorge missed out completely. So it will be especially interesting to see what happens in this year's Qatar race. As we've seen in his battles on the racetrack, Marc is an animal. Marc is a machine. Like Vale in the past, Marc has set some new reference. I would love to see Yamaha winning in 2015. It is possible. Both Vale and Jorge have got a chance. But if you asked me to put some money, Marc will be very difficult to beat. On the other hand, don't forget the second part of last year. Yamaha was very strong. I think the Yamaha at the moment is a very well-balanced package. We will never know which bike is best, but Yamaha was very impressive in the second half of 2014 and I think the package will be very strong in 2015. It'll be up to Jorge, Vale and hopefully our two guys to give Marc a hard time. Marc is not unbeatable. What he's done is more than impressive but now Vale has almost his last chance to win a 10th title and Jorge needs to show for his future that he can remain the boss. Pol is in his second year so he has to show that he can race with the top guys. The same applies to Bradley. When you see how much Vale has improved, and when you look at pictures of Vale in 2004 and 2014 the riding style has changed a lot. I think clearly Marc helped everybody to move forward. It's going to be really interesting to see how they respond. You visited Indonesia with Pol and Jorge during the winter, what did you think of the support for MotoGP? I cannot tell you I was shocked, because I'd been told how big MotoGP is there. So I was prepared, but it was still much more than I was expecting. There were over 60,000 people for a Yamaha Cup race! You cannot believe it. It was like the Sunday of a grand prix. Also I've never seen so many guys coming to a race on a bike. We have especially Assen and maybe Le Mans and Silverstone where traditionally a lot of fans come on their bike, but also a lot by bus and car. In Indonesia I would say 70% came to the race by bike. There were kilometres of bikes on the road coming into the race track - and many of these small bikes were painted in Repsol colours, Movistar colours, Monster Tech 3 MotoGP colours. Pol and Jorge were both there and I'd read that MotoGP riders get treated like rock stars - but it was like being in the Rolling Stones or the Beatles in the late '60s! Like half-god! I've never seen that anywhere. Pol couldn't believe it either. There was incredible passion but also a lot of respect and a lot of knowledge. When we spoke to the fans, they knew so much. For example Pol is not the most famous MotoGP rider at the moment, but there were some fan club guys and they knew everything about him. They knew more than me about what happened in 2014! The following for MotoGP there is crazy. The passion for our sport and our machines is incredible. Honestly I was a bit reluctant to go, because it was the end of the season and you think 'another long trip...' But I came back with a lot of stars in my eyes because these people touched my heart. They love us so much and deserve our respect. There is nothing I would like more than to have a race there. I know it is difficult for many reasons - they do not have a proper track at the moment. MotoGP has got much bigger in Malaysia now, but Indonesia felt 10,000 times bigger. So I was very happy to have been invited by Yamaha and Sakura. It was an incredible experience and a beautiful shock for me. In the evening I had the chance to have dinner with the president of Yamaha Indonesia. He told us that at the moment they cannot match the demand for motorcycles even though they are building factories all the time. Indonesia is a real powerhouse for motorcycles and motorcycle racing. 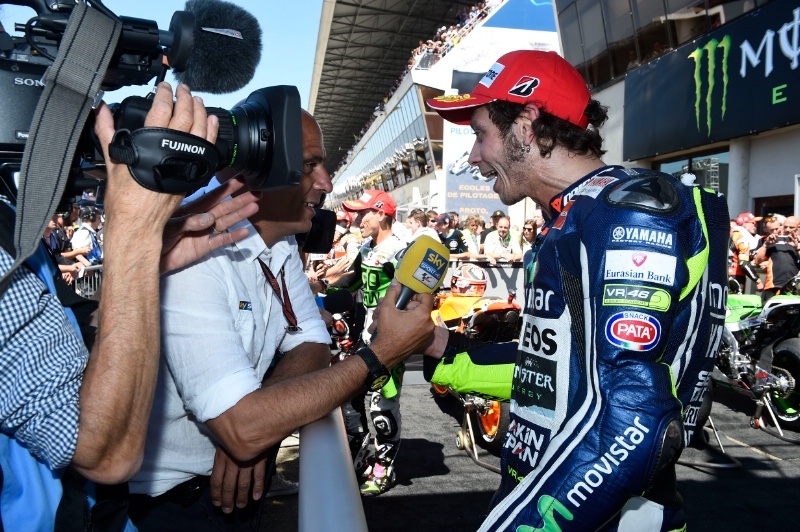 An issue for many fans is how they watch live MotoGP - where do you stand on the debate between pay TV and free-to-air TV coverage? I can only agree with what Lin, Paolo and Livio said at Valencia. Clearly the world is changing. I'm not talking about the Tour de France, Wimbledon, the Football World Cup, Roland Garros or the Olympic Games, which are incredible events that free-to-air cannot miss. But most sports, like it or not, are more and more on pay TV. Why? Because what free-to-air TV want for their business model is something cheap, sometimes free, that attracts as many viewers as possible. General TV let's call it. Am I sad or happy about that? This is the way the world is going and it is not my fault if companies like BBC, TF1, Mediaset or RAI don't want to pay for MotoGP. Having a race team is my love, my passion. But to do it I need sponsors and the promoter, which is Dorna, to help. TV rights are an important part of that. We cannot afford and we cannot let our promoter just miss out on that. Of course the promoter is a company and they need to be financially healthy and there is nothing wrong with that. Especially when you see they are investing so much on improving the TV technology from their side, as well as things like safety. This is just an example and I have no idea of the actual amounts, but if Dorna has the BBC offering '2' for MotoGP and BT Sport offering '20', what do you do? Do you accept your sport being given almost for free? I'm not criticising the free-to-air TV guys because that is their economic model. I've been talking to some TV people in France and they say, 'if we take a 20-year-old American series, it is free and we have x many million watching. If we pay for sport, we have one million watching and it costs us a lot of money, which would you choose?' General free-to-air TV are money machines. They are here to make profit. I don't blame them because this is the system. Okay what if our sponsors say, 'before you were seen by 3 million and now only 1 million on pay TV'? That has never happened to me. Never. Because while you have less viewers on pay TV you also have more time on TV. Instead of just the race being broadcast from the red light to the chequered flag as with free-to-air, you also have all the practices, pre-race and post-race shows, as well as coverage during the week. It is a debate we could have for the next five hours. It's not that teams and Dorna don't want free-to-air, because for sure having 10 million spectators would be incredible. It is that free-to-air TV don't want us - don't want to pay for us. In the end if someone offers three times the money for the same thing, what do you do? It's like when I couldn't keep Cal with me, most of it was because I couldn't pay what Ducati was offering. It does not apply only to MotoGP. F1 is on pay TV and it is supposed to be the number one motorsport championship and have much more power. So it is not Dorna that has decided, okay let's stop free-to-air and go to pay TV. It is just the future of sport on TV. How important is the support that the teams get from Dorna? It is vital to the teams and you cannot ask somebody to support you and not give them the opportunity to attract the money you are asking for. So while it is better to have five million viewers than one million, you have to see the whole thing. If MotoGP is your passion, if you love it and if you see the level and amount of coverage that pay TV are doing - that is how you want your favourite sport presented. For sure you miss out on some viewers by going to pay TV, but some of those viewers were just there by coincidence. They were almost asleep in front of the TV on a Sunday afternoon, watching anything. So sometimes you have to be careful with the figures. How much of the team budgets does Dorna contribute? How much is covered by sponsorship these days? It depends because each team has a different situation. One thing that we all know is that the tobacco era is finished. When the tobacco era was at its peak nobody needed anything from Dorna because sponsorship covered 100% of our costs. We have tried to stabilise the costs. We have tried to find new partners. Some of them have been telecom companies, some of them energy drinks but none of them - and I understand - is prepared to spend what the tobacco industry was spending. I have always said that the tobacco industry created an incredible artificial inflation, which everybody took advantage of at the time and I'm included in that. But it made all the prices go up like crazy and once a price has been up it is very difficult to reduce. We have reduced things very slightly, but mainly we have been trying to contain and stabilise the costs to stop the madness and crazy inflation. But it doesn't matter how good your marketing department is, it is not easy to find 100% of your needs now. This is why we need the three main parties to cooperate with each other. The manufacturers need to understand they cannot lease their bikes too expensively, the championship has to understand that if they want to sell a show they need exciting actors and the teams need to be as good as we can at marketing and fair and clear with our budgets. I think now we have a really good situation where the manufacturers and the championship have almost the same target and an identical vision of the near future. This is helping us to be able to carry on and stay alive. Again, F1 is supposed to be the biggest motorsport in the world and the giant car manufacturers are involved. But they are still struggling more than us financially and we have seen several 'satellite' F1 teams collapse at the moment. Fortunately we haven't seen a Pramac, Tech 3, LCR or Gresini team say they can't afford to go to the last few overseas races, as happened in F1 last season. It means our manufacturers, our promoter, our teams and Federation are working well together and understanding the needs of the others. This is why I think the MotoGP championship is quite healthy and we can look at the future with optimism. 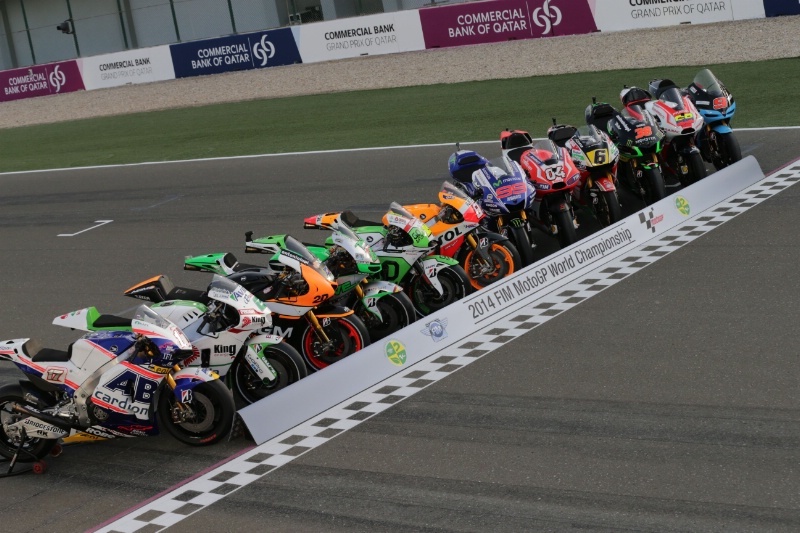 That doesn't mean we are in a dream world, but because of the decisions we have taken and what MotoGP will be from 2016 - and what Moto2 and Moto3 is now - we have a good show at a reasonable cost. Everybody is happy to be part of it and manufacturers are returning. I don't want to sound corporate or conservative. I like to think I have balls and I am not shy to say what I think. I'm a man who loves what he is doing and believes in our sport. But very often I still behave like I'm a fan. I'm like the guys that go to see a race. So I understand their position and I like to talk to them. I understand their position about TV coverage, but I hope they understand that to have an exciting grid, an exciting show and great battles this is the only way. I hope the fans understand what we have to do to give them the sport we all love.